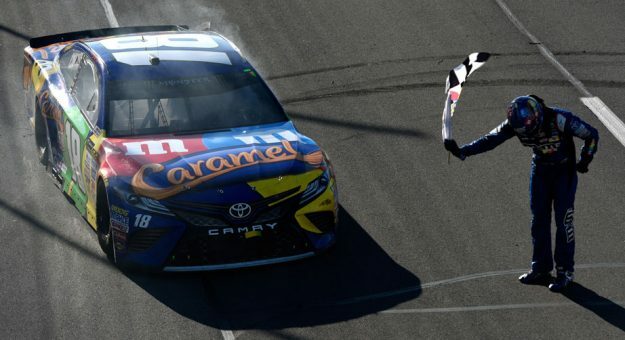 The Monster Energy NASCAR Cup Series completed its second trip to the “Tricky Triangle” on Sunday for the Overton’s 400 at Pocono Raceway. In contrast with last year’s running of the event, which left Chris Buescher in Victory Lane when the race was called due to poor visibility, the skies were dry and clear. And, much like last year, the race produced a few firsts of its own. You can always expect differing strategies when there’s stage racing at Pocono. Well, not that kind of stage racing — rather, the kind that produced Clint Bowyer’s first playoff point of the season when the leaders ducked to pit road on Lap 96 before the end of the second stage, handing the lead and eventual stage win to Bowyer’s No. 14 Ford. Thumbs up for different race strategies that produce unexpected results — including a first-time stage winner. Racing in NASCAR takes a lot of work. Imagine spending your week preparing a car, loading it into a trailer and heading north, sending your crew 600 miles away, taking the weekend to perfect and fine-tune every aspect of your race car — only to wreck it on the very first lap of the race? That was the reality for Aric Almirola and his No. 43 team, after Matt Kenseth got loose and triggered a multi-car incident on the opening lap of the Overton’s 400. Almirola’s car was towed back to the garage without completing even one of the 160 scheduled laps Sunday. All that work with virtually nothing to show. Matt DiBenedetto’s No. 32 was also a casualty of the incident — but at least he got credit for completing a lap. Thumbs down for crashing on the first lap. When you’re a rookie, you’ve got your work cut out for you. You’re trying to build your name, compete, earn respect, and keep stakeholders happy. It’s a tall order. Rookie Daniel Suarez again impressed at Pocono with a top-10 finish — his seventh of the season (and fifth time finishing P7). His knack for picking up positions at the end of the race is proving useful as he inches toward the cut-off line to make the playoffs. Thumbs up to a solid first season so far. Crashing, most would agree, is best to avoid. Especially when it involves your teammate. Unfortunately for Hendrick Motorsports teammates Kasey Kahne and Jimmie Johnson, contact between the two ended Johnson’s day. Thumbs down for the unfortunate circumstance and awkward competition meeting on Monday — but at least both drivers will likely compete in the playoffs this season due to their race wins earlier in the year. It’s hard to award the Biggest Thumbs Up of the Week to anyone but Kyle Busch. Not only did he win the pole and lead the most laps to score his first win of the year, but he finally crossed Pocono off the list of tracks where he’d never won — leaving just Charlotte Motor Speedway. Although, isn’t the Caramel M&M’s logo a little weird? Like, why are the M&M’s characters pulling apart one of their own? I don’t like it, although the candies are delicious. Thumbs up to Rowdy, regardless, for his first win on a triangle.